Laura and I have been keeping bees for six years now. Seems like only yesterday when someone plopped a one-deep hive in our yard and said “Here, read this book.” (Not a recommended way to start beekeeping, BTW). Even so, we bought bee jackets and a smoker the next day and started read everything we could. 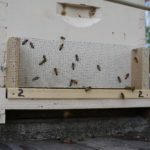 The bees swarmed in three weeks. 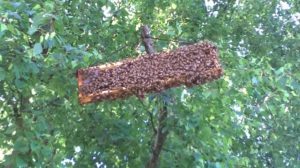 A little about catching swarms: At the PSBA summer potluck picnic two years ago, an elder (read experienced) beekeeper from North Carolina told me “You could get a swarm out of a tree if you can get a brood frame close to it. Just tie a rock to a string and toss it over a higher branch, then haul up the frame. 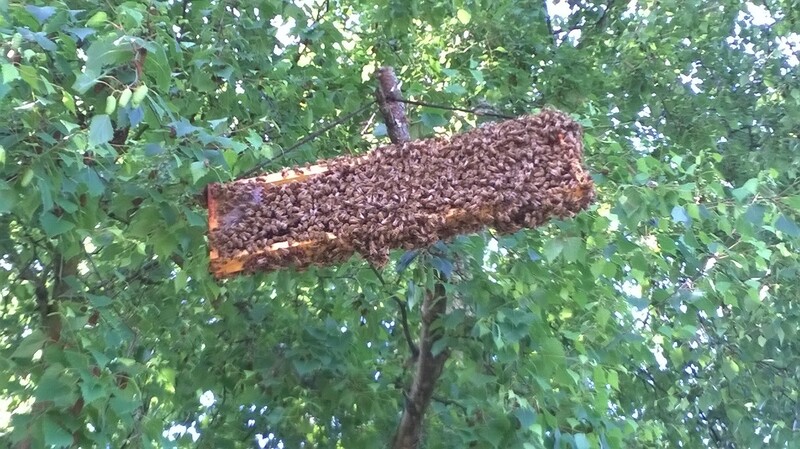 It works better if the comb has open brood in it.” Here’s a picture of a brood frame I hung very close to bees that were left behind after someone got the main swarm. These bees were reunited with their main colony. That gentleman was a treasure. Honey Production Split brought in the honey – notice the hive that is 7 boxes tall! Splits: In 2014, I did a “walk away” split for the first time for swarm prevention. 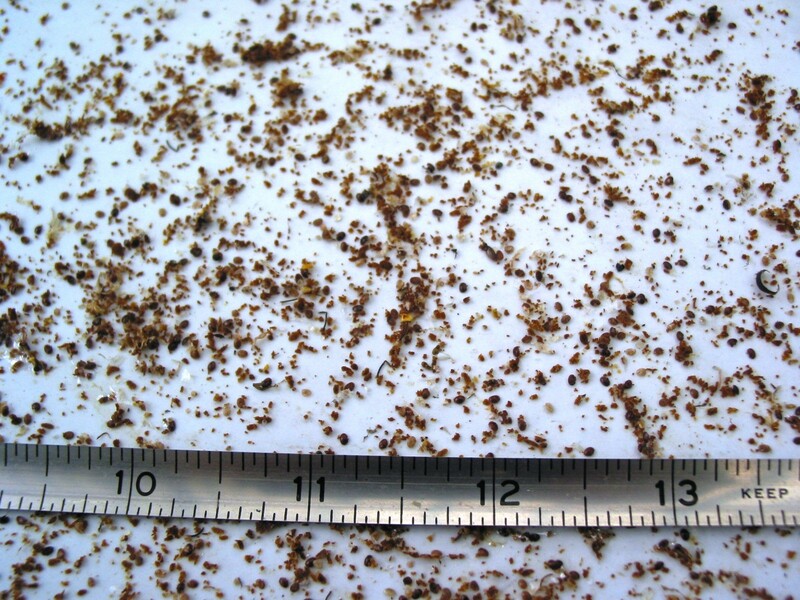 It was easy – split the colony into two, each having equal numbers of eggs, larvae and capped brood. The half with the queen thinks it swarmed, the other half raised a queen. This year, I took Kathy Cox’s PSBA-sponsored class on splitting hives. One method she described was called a “honey-production” split. Basically, half the split is one frame containing eggs and larvae, plus all the frames of capped brood. The first half of the split is the queen, the frames containing the rest of the eggs, larvae and a lot of nurse bees. The bees think they swarmed and go about their business. The second if the split half has a few nurse bees that raises a new queen, but the rest of the huge number of workers and emerging brood have nothing else to do but to gather nectar and make honey. 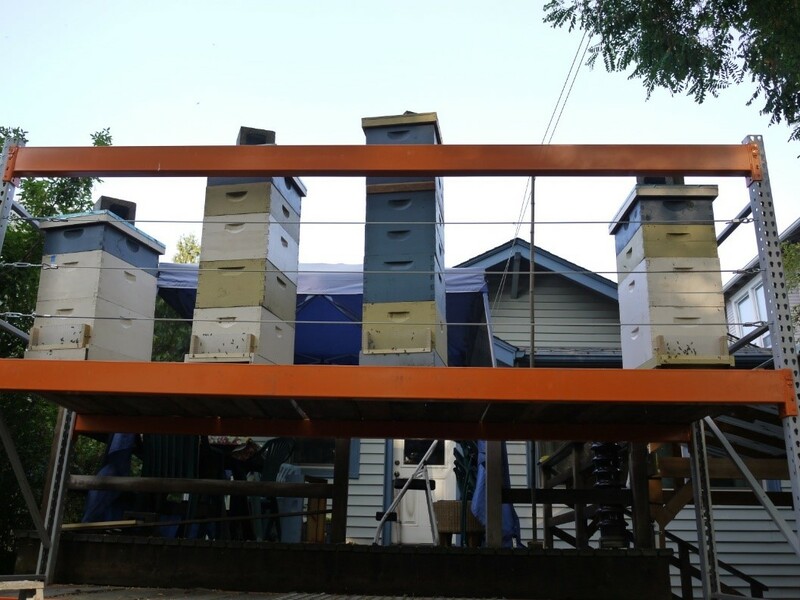 In the picture at right, the center hives got to seven boxes tall shortly after the blackberry flow. 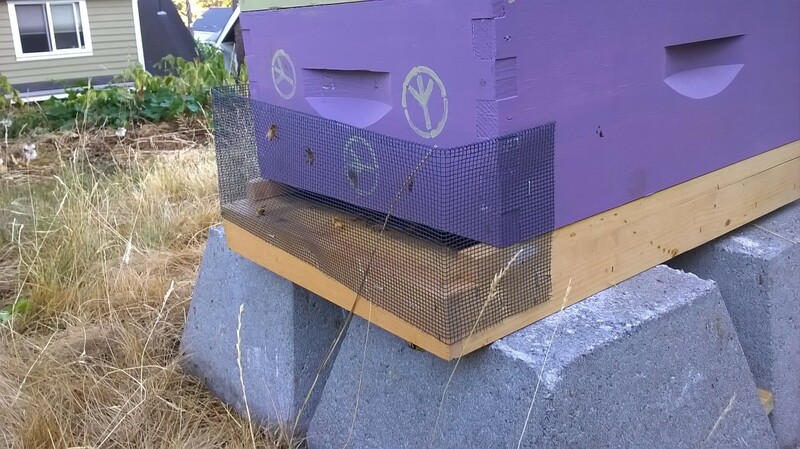 I was too optimistic for the outer two hives and had too much space for the colonies. By the way, we did get a personal record for honey this year. Kathy Cox is a treasure. 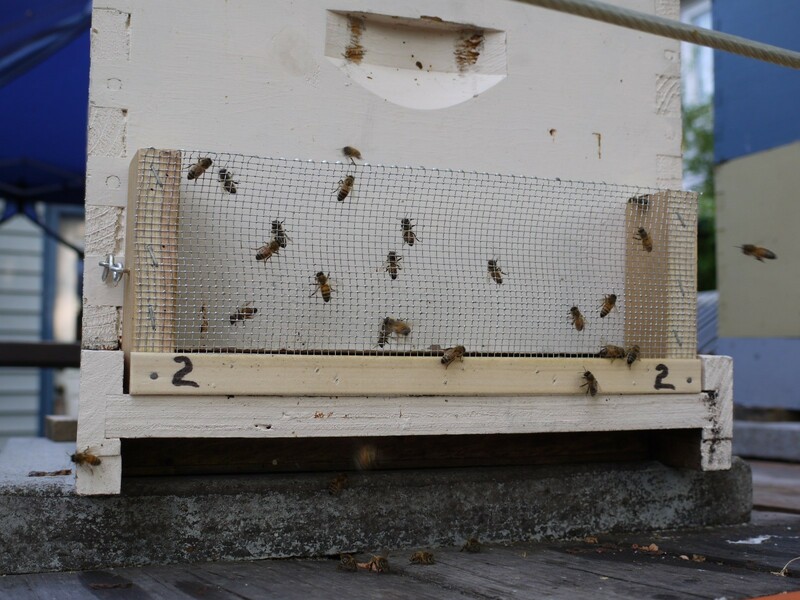 The screens prevent robbing of the hives, but don’t preclude the colony going out to do the robbing. What a treasure we have in Maureen, and also the PSBA speakers. Does your sticky board look like the one above? 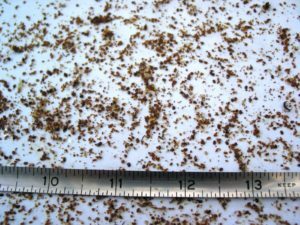 “Natural” varroa treatments can and do work, but there’s a lot of work that goes into it, not to mention methods, experience, observation and timing. My mentee had the methods. Experience? Second year beek. Lost the first year colony. Observation? Getting better with experience. Timing? Oops! Danny Najera and a team of students making observations on and inserting sensors into our hives. Gathering data for overwintering success: Danny and his team will collect data on temperature and humidity during the winter and make correlations with colony mortality. I’m going to try to skew the data by having 100% colony survival this winter. (Two years ago, I took part in Danny’s mite count study. I sure learned a lot about observing and treating for mites.) Danny Najera is a treasure. 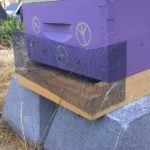 Bees will find the honey – oops! 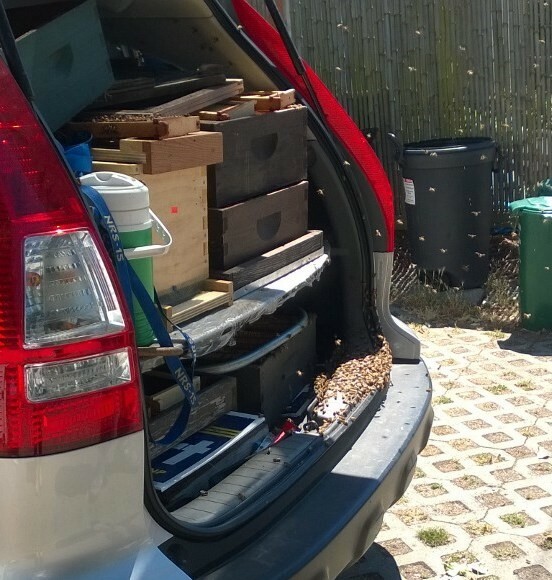 This picture was taken after my bee buddy (she’ll remain anonymous) after honey extraction parked her car in a mostly-enclosed garage with wet comb in the back. The windows weren’t exactly all the way up. We estimated 5000-8000 bees in the car the next morning. Having left her bee suit in the car, I had to come to the rescue. If you’re ever in a similar situation, just make sure the door is pointed toward the sun, open the door or window and the bees will leave in that direction. Yes, my bee buddy is a treasure, too. This article was submitted by PSBA neighborhood captain Kevin Gow. 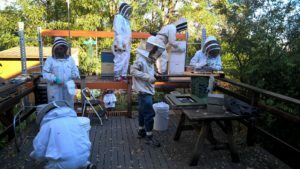 He and his wife Laura are ever present volunteers for PSBA and we certainly consider both of them a treasure along with their contributions and support of our community of beekeepers.